Reforming the Line – "I am starting a revolution; I am re-forming the line"
“Now the Lord is the Spirit, and where the Spirit of the Lord is, there is freedom. And we, who with unveiled faces all reflect the glory of the … Continue reading A highly forcible argument…. HAPPY 143RD BIRTHDAY TO GILBERT KEITH CHESTERTON! 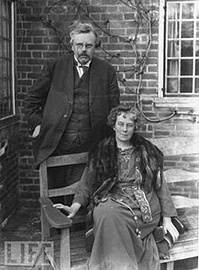 On May 29, 1874, a genius was born to Marie Louise, née Grosjean, … Continue reading Happy Birthday, Mr. Chesterton! It Is Impossible Without Humility…. “The modern world is full of the old Christian virtues gone mad. The virtues have gone mad because they have … Continue reading It Is Impossible Without Humility…. What did Chesterton sound like? Have you ever wondered what G. K. Chesterton sounded like when he spoke? Well, we have a treat for you … Continue reading What did Chesterton sound like? Lá Fhéile Pádraig Sona Duit! May the Irish hills caress you. May her lakes and rivers… Continue reading Lá Fhéile Pádraig Sona Duit!